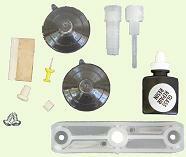 These are the common Bridge Resin Delivery System components required to repair most stone damaged windshields. Included in this group of parts is a Bridge / Applicator Base, Resin applicator, Resin driver, UV polymer rosin, Curing Strips, and a safety razor. There are additional items that will be covered as we go through the list of items and their use. You will also need a knife or scissors, drop cloths or towels, paper towels, and alcohol. There are several designs for Bridge Type Resin Injector devices. This example has a straight bridge and is the most common found in the bridge type windshield repair kits and must be assembled prior to use. See Bridge Assembly Instructions for assembly. The base of this reusable device that looks like a cross with suction cups at the edges to hold the device in place and a hole in the center. 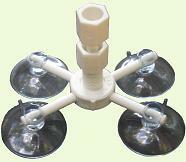 This device along with a Resin applicator serves the same purpose as the pedestal and is good for multiple repairs. The suction cups hold the base firmly to the windshield glass and the base acts as a mount to hold a resin applicator in place and firmly against the windshield glass. Note: there are some other resin injection devices similar to this, some with one and some with two or more suction cups. The Resin Applicator Injector Body is a hollow tube that is threaded on the inside and outside and acts much like a syringe body. It is screwed into the base like a bolt until it makes firm contact with the windshield glass. 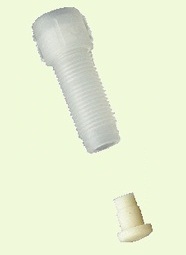 Its tip is a rubber like seal that makes an airtight seal with the glass once a slight amount of pressure is applied. It is used as a reservoir to hold a measured amount of Resin to be delivered to the damaged area of the windshield.